This painting is very unusual. Unlike all my other paintings, it wasn’t designed in my normal waking state—it was a gift from a dream. I don’t fully understand its meaning and complexities myself, but it’s exciting to be in a sea of possible interpretations. Although there’s a bit of a dark velvety isolation in the atmosphere of this piece, the rooster in front looks directly at the viewer with his critical, sassy eye and makes everything ok. “You can bob with us,” he seems to say. The yellow dawn sky is confettied with reds and greens—it’s quite surreal and suggests an approaching morning storm. Dark blue and pale ochre hues in the reassuring, dimpled ocean soothe the tension created by the sky’s unusual color palette. I achieved the ocean texture by pulling fingertips through thick paint, essentially mimicking the undulations of the water with my hands. Painting that ocean felt like interacting with a living being whose fur or feathers I was petting into place. 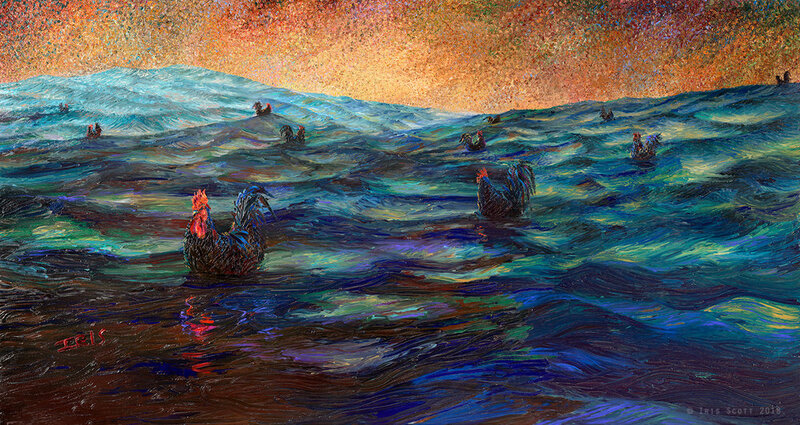 Curious to understand my own dream, I researched roosters after the painting was finished. They’re known to symbolize the victory over darkness every morning and are thus considered bringers of good fortune in countless cultures worldwide. They are linked to industriousness and positive attention. In this water, they’re exposed but too cocky to notice it. Keeping a consistent distance between each other they are at once alone and together. I also consider the timing of this dream, it happened right as I was starting to become a painter full time. Perhaps it was my subconscious sending fair warning about the isolated and exposed career which was ahead of me, albeit a magical voyage. What message do you see? Hang this painting above a bed! I believe it has the power to bring forth prophetic dreams.